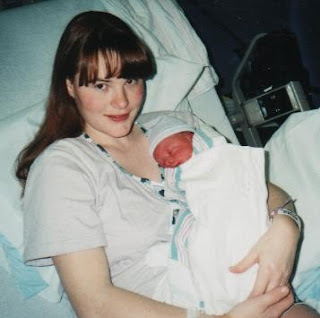 At 6:43 AM, January 22, 2001 our daughter, our miracle, was born. As soon as Emily was out, she was handed to the neonatal team. I was exhausted, but still focused. I was flat on my back and couldn’t see what was going on. I also couldn’t hear anything but some noise coming from the corner. I turned to Mark and desperately asked if she was alright. Then I heard that first sweet cry. It was music to our ears. At least one thing was right, she was breathing. I tried to concentrate on what was going on in the corner, but I was being cleaned and stitched at the time so it was hard. Poor Mark was having to go from one to the other to try and offer some comfort. At last, the neonatal team finished their exam and gave the baby over to the nurses to be cleaned up. Then she was weighed (7lbs 1oz) and wrapped to hand to her daddy. As Mark and Emily made their way toward me, I called over his shoulder and asked for her Apgars. She had scored a 9 and a 9. Almost perfect. Mark handed Emily to me for the first time. 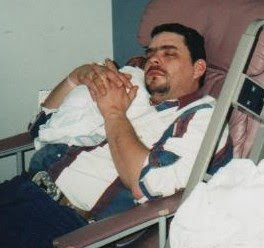 Her weight in my arms felt strangely familiar and comforting, like she was meant to be there. I looked down into that wondrous face and declared that she was beautiful. She wasn’t cute or adorable, but beautiful. So perfect looking. She had dark, almost black hair. It wasn’t very thick, but it covered her entire head with just a hint of curl. Her eyes were a medium blue, her nose petite and she had the most gorgeous lips. All eight of her fingers and two thumbs were long—she had piano hands. Curiously, I looked at her head. Mark noticed and remarked to me, “It’s not what we expected, is it?” A little bewildered, I shook my head, ‘no’. Emily’s head didn’t appear to be larger than normal. Every little detail of her seemed to be perfect. While I was holding Emily, I thought I should call my parents and let them know she was here. I used a calling card to make the long distance call. It was only about 6:15 in the morning at their house, but I figured they wouldn’t mind waking up for this. My mom answered, but we were only able to talk for a few minutes before I started feeling faint. I told her I thought I was going to pass out and quickly hung up the phone while simultaneously handing Emily to Mark. After a few minutes I felt better so I took Emily back and placed the call again. Unfortunately, I started feeling light-headed again and had to cut my call short. A few more minutes passed and I thought I would try a third time to call my mom. Once again, I began to feel faint, but I tried to hold on so I could talk to my mom. A nurse noticed this time that my blood pressure had dropped to 70/30. Yikes! No wonder I was feeling so weak and faint. I had to get off the phone then so they could take care of me. Things were just a little hectic for a short bit while my blood pressure was being sorted. I think I may have even blacked-out for a few moments. I later learned that the most common side effect of an epidural is low blood pressure. Overall, I wasn’t very impressed with the epidural. For one, I discovered I probably hadn’t really needed it. Emily was born less than an hour and a half after it had been placed. Epidural can cause labor to slow down. I think I could have endured the rest of my labor without it, but I had been afraid it would last five more hours. For another, it did not give me total relief from pain. Believe me when I say I still felt plenty as I pushed Emily out. Not to mention, it was the most likely culprit for my low blood pressure. After some extra fluids in my I.V. (ick! ), I began to feel much better. Good enough, in fact, to be moved to the post partum ward. I was helped into a wheelchair and Emily was placed in my arms. We were steered down a couple of hallways and placed in the room immediately adjacent to the nurses’ station. I suppose they wanted us close by, but the room was one of the few that hadn’t gotten redone in the past year when the maternity wing had under gone renovation. It was also quite small and dreary compared to the large labor and delivery room. The worst thing about the room though, was how uncomfortably hot it was in there. I got settled into bed and had just enough time to order breakfast before we were interrupted by a nurse wanting to take Emily for testing. They wanted to do an ultrasound on her head and an MRI. I hadn’t even had a chance to feed her yet, and they were wanting to take her away. They said it would only take a couple of hours and since Emily was sleeping already, we reluctantly let her go with the nurse (after double-checking her ID). As we waited for Emily’s return, Mark and I called the rest of our families. Then we passed some more time eating breakfast. The hospital food was surprisingly good. I had never had a hospital stay before, but I had heard horror stories of the food. I was completely ravenous and ate three pancakes, two eggs, toast and even grits. I ate like a starving person. I never realized giving birth makes a woman so hungry! Of course, I hadn’t had anything to eat in over 12 hours and I had been awake that whole time. After breakfast, I took a l-o-n-g, hot shower. Being fed and clean made me feel human again. True to their word, Emily was brought back to the room a couple of hours after she had left it. We were told we would have the results of the tests later that afternoon. It was about 10:30 AM and I felt like we were finally together as a family for the first time. I know we were together after delivery, but I had been so ‘out of it’ and all the adrenaline and worry had been coursing about the room like a swarm of bees. Now things were relatively peaceful and calm. We could take the time sit back and marvel and this phenomenal individual we had created. Emily was being quiet and we took turns just holding her and enjoying being parents for the first time together. Soon, my daytime nurse stopped by and helped me latch Emily on for her first feeding. It was more difficult than I had imagined. Since I had avoided information on newborn care out of preservation of my sanity, I hadn’t read up on breast-feeding. Nor had I witnessed anyone else feeding their own child, so I was flying without a net. 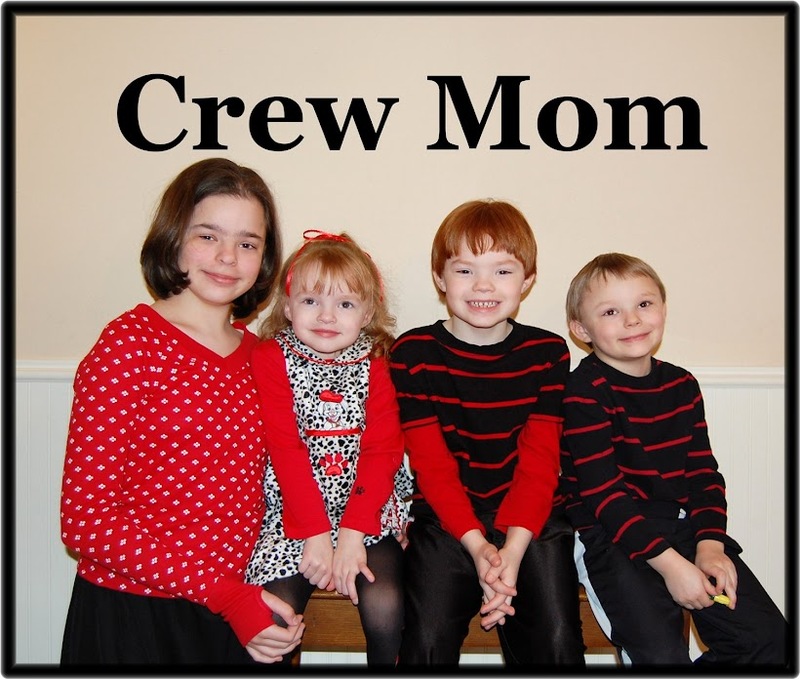 I just expected my mothering instincts to take over and I would know exactly what to do. Turns out it is not that easy (or it wasn’t for me anyway). Nursing wasn’t hard, per se, it just took a little bit of practice and some patience. My nurse was wonderful and helped me get the hang of it. I would have some trouble down the road with breast-feeding, but for now things were going smoothly. In the afternoon, a pediatric physician came by to examine Emily and give us the results of her tests. Emily passed her physical with flying colors. She was alert, strong and seemingly healthy. The doctor told us that Emily most definitely did not have hydrocephalus. This was good news to hear. 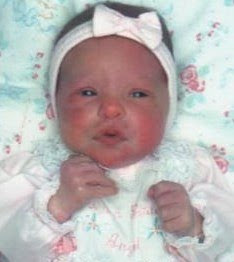 This meant that she would not have to have surgery when she was only two weeks old. The bad news was we now had something completely different to deal with: the MRI showed Emily was missing a part of her brain.